It’s often defined as “competition for the same objective or for superiority in the same field.” When comparing Evgeni Malkin and Alex Ovechkin, that sounds about right. The two go back to their days as teenagers growing up in the Russian hockey system; Malkin with Magnitogorsk Metallurg, Ovechkin with Moscow Dynamo. The latter’s actually a year older than the former, but one would never know if they just went by media attention. Ovechkin’s a late 1985 birthdate, while Malkin showed up in the summer of 1986. As such, they were both NHL Draft-eligible in the same year. On a late June day in Raleigh, North Carolina, the two were selected back-to-back to commence the draft. Comparisons were already being made during that 2003-2004 season. In hindsight, they were just getting started. Lets start with the games just prior to that now-significant draft. And by “just prior”, we’ll include most of their draft-eligible season. 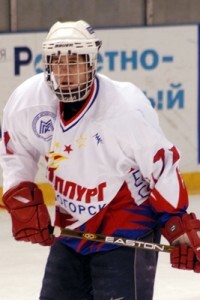 Ovechkin was a 17-year-old prodigy rising through the ranks, and was the youngest player on Moscow Dynamo’s roster. He finished that season third in team scoring, just behind Vladimir Vorobiev and Alexei Chupin. Ovechkin played in 53 games, and potted 13 goals. Measly numbers by today’s standards, really. Yet, he led the team in goals. Just for kicks and giggles, he was one of 14 players who suited up for the team at least once that season who had “Alex” in their first name. Shoutout to Alexander Radulov, who was one of those guys. Evgeni Malkin was on his way to NHL stardom from a young age. Seriously though, look at those mitts. Malkin was another teenager making a name for himself in Russia, but not quite at the same rate as Ovechkin. The younger wasn’t even in the top-fifteen in team scoring in 03-04, but that doesn’t mean a whole lot now, does it? Malkin had 12 points in 34 games with Magnitogorsk Metallurg. Clearly, numbers don’t mean all that much when evaluating long-term potential. And 13 other people didn’t have the same name as him. Total bummer. The NHL Draft that season was special in its own way, as it was the last event before the lockout of the 2004-05 NHL season. Two Russians were the first two picks, but only one could go first. It turned out to be Ovechkin, who was chosen numero uno by the Washington Capitals. Malkin went second to the Pittsburgh Penguins, who were still in the early stages of realizing they were building an organization full of young talent. An infamous work stoppage prevented the two from making their NHL debuts the following season. However, Malkin didn’t feel he was quite ready yet anyway, so he stayed in Russia to play another two seasons with his hometown team. Ovechkin, being the outgoing character that he is, was ready to get the party started. By the time the 2005-06 season rolled around, Ovechkin was all set to to show North America exactly what he was capable of. Then again, so was everyone else. What made Ovechkin different was his passion as a young star. Ovechkin scored over 50 goals and 100 points that season, and took home the Calder Trophy as the league’s top rookie. That trophy win came over another young phenom, this one named Sidney Crosby. Over the ensuing years, their rivalry became a story in itself. Malkin rolled into town the next season, showing up in Pittsburgh in 2006. Just in case there was any doubt, he showed the world his talent by also taking home a Calder Trophy. His numbers weren’t the same (33,52,85), but it became clear his size would greatly benefit him. Little did fans know just how much it would. 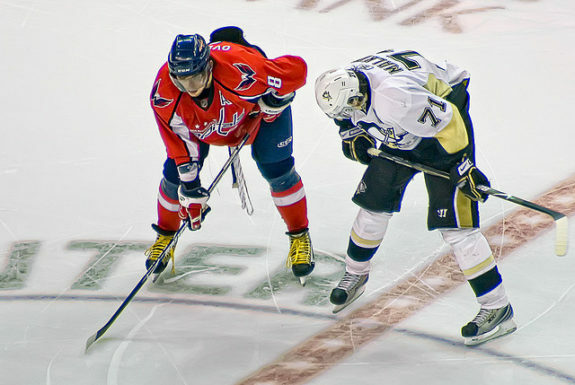 After just a couple seasons, Malkin and Ovechkin had taken over the National Hockey League. They had crossed the pond in style, and displayed unique levels of passion and skill. In the years that followed their rookie seasons, the two began to dominate the league’s awards. Malkin took home two more individual trophies in 2008-09, reeling in both the Art Ross and Conn Smythe trophies. Ovechkin captured the Art Ross, Hart, Lester B. Pearson, and Maurice “Rocket” Richard trophies in 2007-08, and another Hart and goal scoring crown in 2008-09. What many struggle to understand is this: with all their talent and similarities, and their history of friendship, where did everything go wrong? At the 2006 Winter Olympics in Turin, Italy, Malkin and Ovechkin were actually roommates, and media regularly spotted the two hanging out off the ice. But on January 15, 2009, Puck Daddy published a post entitled “Malkin: ‘Ovechkin shouldn’t behave that way the next time’.” In it, a Russian interview with Malkin was translated, and it revealed some interesting quotes. Normal [relationship]? Then why are you trying to knock each other’s heads off? Why does Ovechkin hit Malkin? Shed some light on this mystery that is two years old now. Do you even talk to Ovechkin? Well then. Though those words were spoken four years ago, by all media accounts, their relationship hasn’t changed much. Reports from 2009 told of a rumored incident that took place in Moscow where Ovechkin apparently threw a punch at Malkin’s agent in a nightclub. Ovechkin would shoot down the report, but Malkin was pretty insistent it happened. Malkin summed it up nicely at the time, saying it was a “bad situation”. After years of constantly being mentioned in the same sentences, perhaps they just got tired of each other. It happens to many of us. And who could forget about those girls in high school: That awkward moment when you feel like you don’t even know someone anymore..hey, young woman, move on. Now, to be clear, no one here is calling either Malkin or Ovechkin a little girl. Both are outstanding talents, and after a while, it gets old real fast when you’re always being compared to someone else. Perhaps they were never really friends in the first place, and were just getting along for the sake of their personal brands. It’s possible, is it not? Every single day, high-profile celebrities are putting on faces to hide their feelings of annoyance and frustration. Professional athletes are no different than anyone else who’s regularly under a spotlight. In the last two years or so, Malkin has emerged as the more dominant of the pair on the ice. The big Russian who goes by ‘Geno’ has pushed himself ahead of Ovechkin’s pack, and ‘Ovi’ has been slipping on the trail left behind. Trade rumors are all over Ovechkin at the moment. Washington’s awful start to this shortened season has raised all sorts of possible trade scenarios shipping out the Capitals’ captain. Ovechkin hasn’t come across as the same exuberant, passionate forward he’s been in the past. Highlight reel-goals with his name on them have been rare lately, and the media’s been practically attacking him for his “selfish” style of play. He’s being called “too predictable”, and in many ways it’s very true. Malkin hasn’t been dominating the competition either this season, but he’s still second on the Penguins in scoring, behind only who many consider to be the best hockey player in the world, Crosby. There’s an unwritten rule in many NHL fantasy leagues that says “Malkin always goes first”, and this season, Ovechkin wasn’t even picked in the top-ten of many leagues. Those who did pick Ovechkin have been desperately trying to trade him. Russia will be hosting the 2014 Winter Olympics in Sochi, and Ovechkin has made it clear he intends on playing regardless of what the NHL thinks. Most Russian players won’t be far behind. For the sake of their native land, Malkin and Ovechkin will be put together on the same team once again. This time, they’re hoping for a different outcome than the last couple Olympics. In terms of impact on the community, it’s hard to deny the affect Ovechkin’s had on the Washington Metropolitan Area. Compared to Malkin’s in Pittsburgh, Ovechkin’s has been greater, if only because Crosby’s the main man in PensNation. The lives of Evgeni Malkin and Alex Ovechkin have been similar, yet very different since 2003-2004. Both have inspired a young generation of hockey players, and both have changed the way many fans see the game. But the days lying ahead will tell more stories of competition, and will most likely create some great matchups whether Malkin and Ovechkin are close or not. Here’s to another ten years of a great rivalry.